I am very very very excited to announce that I am back to normal with blogging! Since November last year, I went on holiday and went to enjoy life with my family overseas. However, due to unknown reasons, Adelaidefoodies.com is somehow blocked by the Chinese authorities and hence I was not able to publish anything on the site. Now after this 3 months “long holiday”, both Tina and I are fully energetic and we are looking forward to an adventurous year of blogging in 2004 :D. Instead of 3 posts each week, I will be trialing 6 posts each week this year and see how it goes. 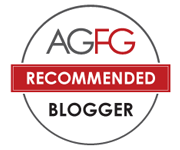 I would really appreciate for all my readers’ continuous supports during the last 3 years after Adelaidefoodies.com was established. Let me get into the topic of this post. When I reviewed products and service of Provi to your Dore, some people asked about whether there were any local food business which might make ready to eat dinners. Unfortunately, I didn’t know any, but there are services that can help customers to order directly from restaurants. Before I left Adelaide for holiday, I was requested to review the service of Eat Now. 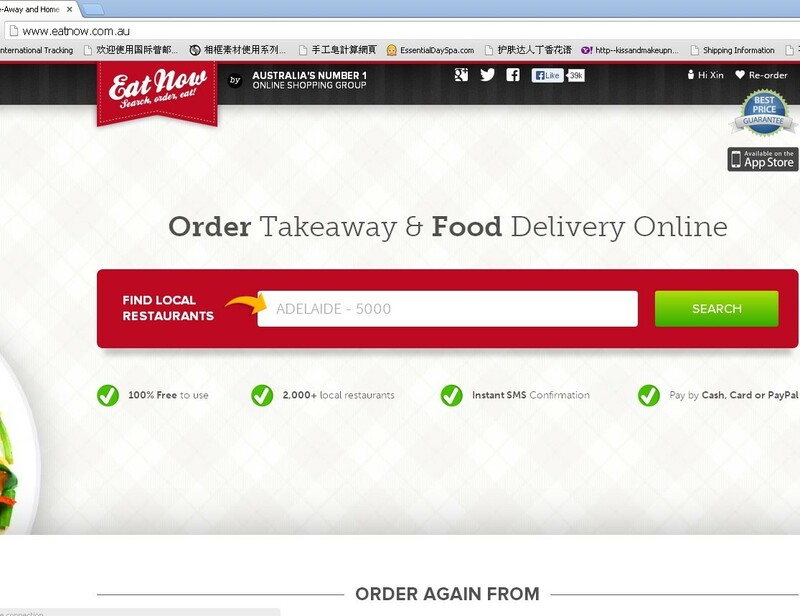 Eat Now is a leading online order website for take-away and home delivery from restaurants across Australia. At the moment, it connects Adelaide diners to 29 local restaurants and is looking forward to expanding in future. The service was very easy to use. Once logged on to the website, I entered my postcode, 5000 and a number of restaurants appeared in the menu. The good thing about this website was that people can choose different food they like and make their own dinner. It also saves time for some busy professionals who can order online and then enjoy hot food once they arrive at home. 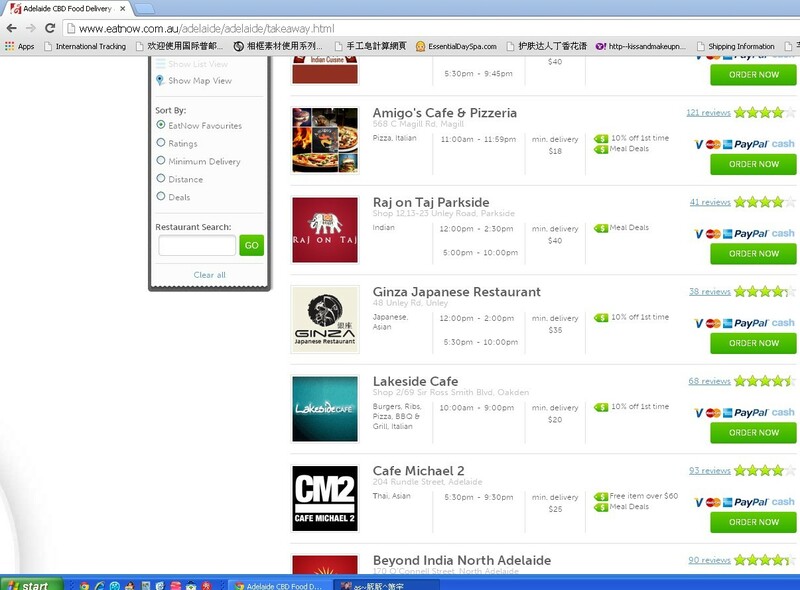 Then, people can choose which restaurant to order from. I decided to go with Namaste, a Nepalese restaurant at Parkside. Since this post is to evaluate the EatNow website, I will not do a review on the restaurant and food. 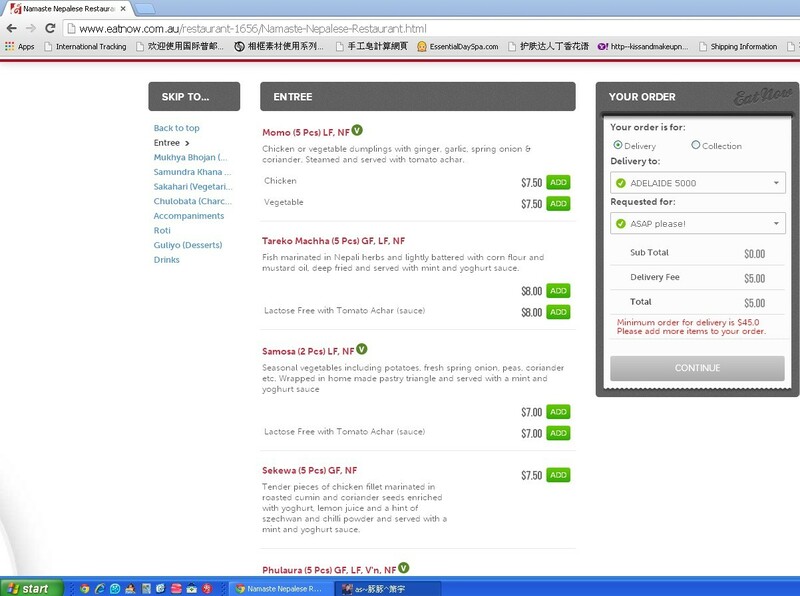 Anyway, once clicked into each restaurant, a full menu for delivery or pick up is available for customers. All menus are pretty comprehensive, ranging from delicious entrees to moreish desserts and drinks. Some restaurants even have discount for the first order and free items. For Namaste, first time customers can get 15% of the total bill. 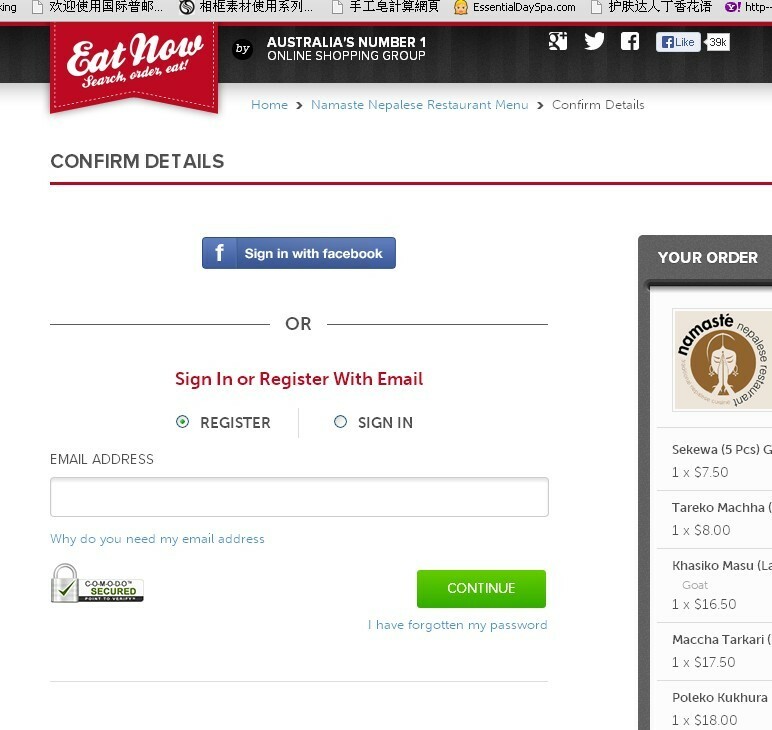 After ordering the dishes required, the customer will be lead to the “sign in” page. As for most websites, the first time customers can register for the site and then use the service. 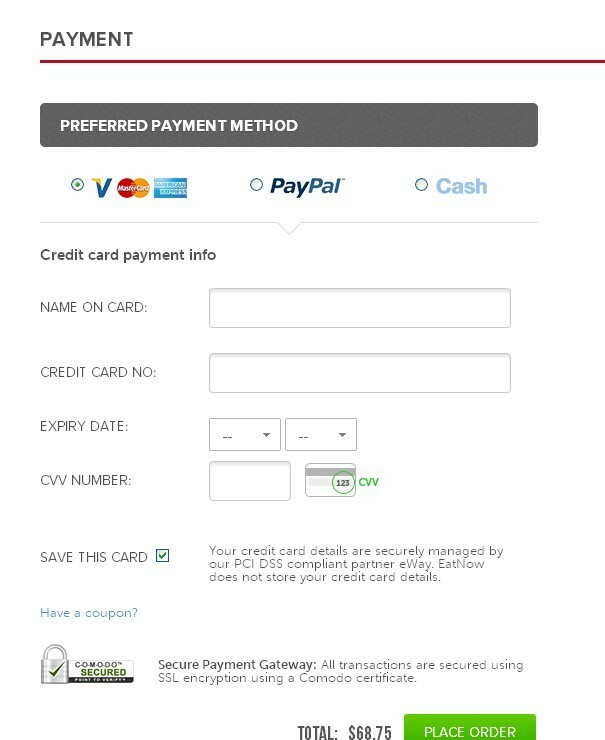 However, one feature that I really like was that visitors can sign in with a facebook account which can save a lot of time to do all the “filling the form” activities :D.
Once signed in or registered, shoppers can choose to pay by credit cards (Amex, Visa or MasterCard), Paypal or cash on delivery. These payment methods eased the purchasing process and can accommodate different people’s needs. The payment system was pretty quick with no pause during the process. After the payment has gone through, I was taken to the confirmation page and it specified the approximate delivery time, etc. There is also the phone number of the restaurant to be contacted in case that the delivery does not come. Around 6:20 pm, I received a sms on the phone I registered and said my delivery was 10 mins away. Originally, I wasn’t paying too much attention to this as most of the delivery service would not arrive exactly on time. 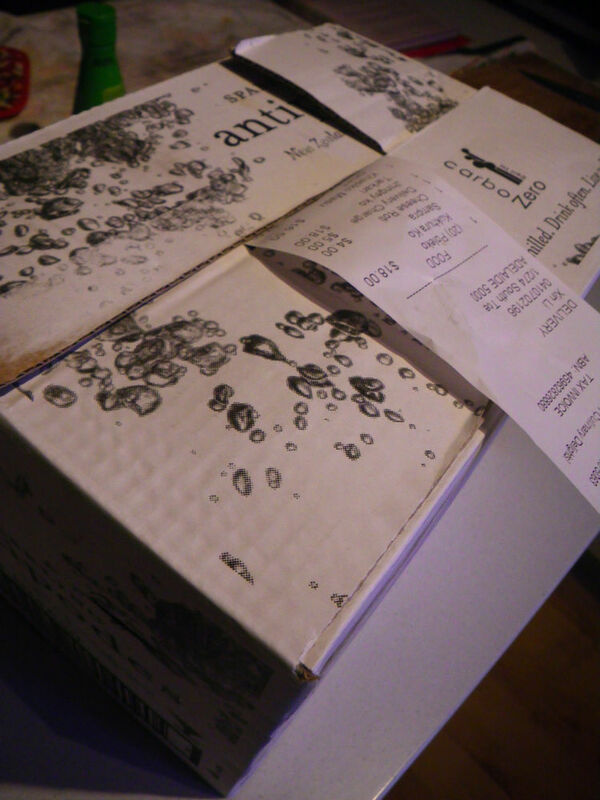 However, at 6:30 pm, the door was knocked and a kind deliverer handed a big box of items to me along with my receipt. It was right on time! Before the box was even opened, Nepalese spices aroma was already everywhere and we both got so starving :D.
Wow, a full box of foods? Yes! We ordered 3 entrees, two mains and 2 roti. All together it cost just below $70 and both of us were treated very full. The quality and quantity of the food were same to that if you dined at the restaurant. The only difference was that you brought that table back home and you could enjoy numerous TV entertainments while enjoy your food. How good is that! 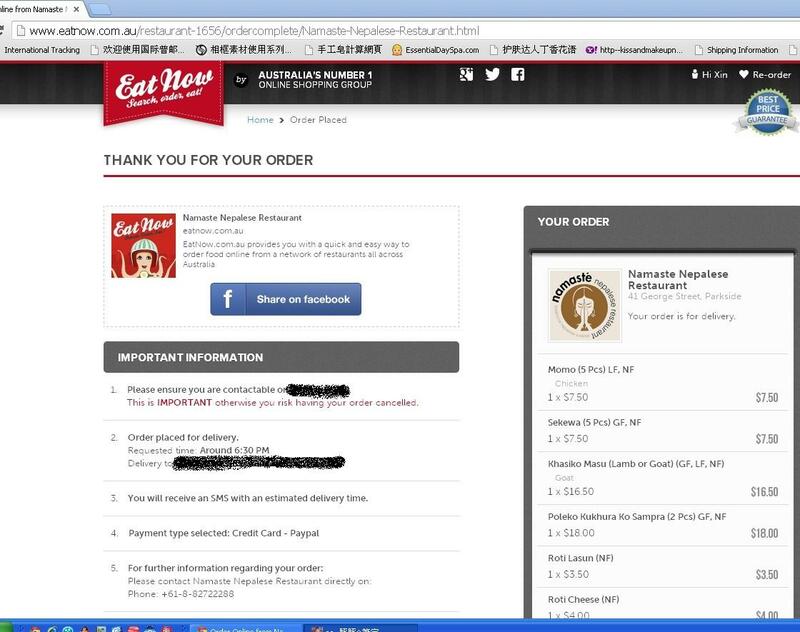 We really enjoyed both the service of EatNow as well as the food from the restaurant. 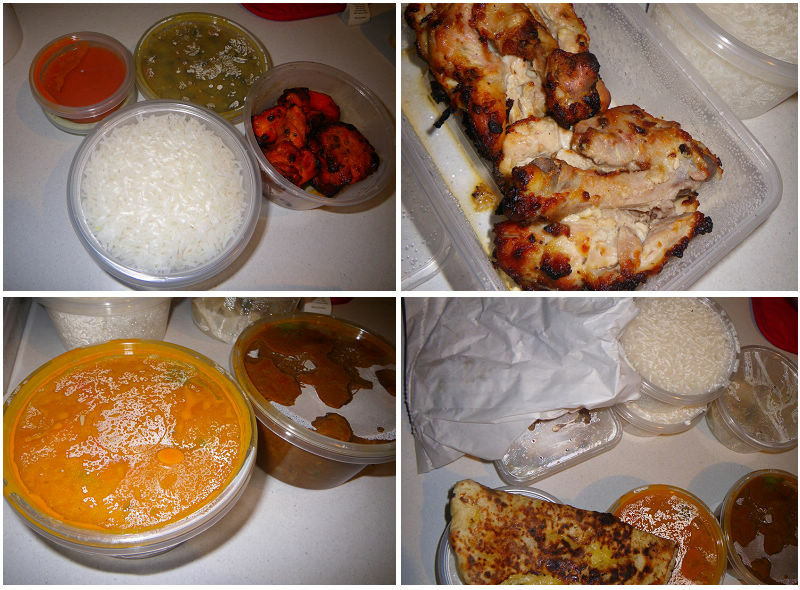 The quality of food was good and the delivery time was within the estimated time frame. By using websites such as EatNow, consumers can get a taste of a lot of different restaurants and foods all at once and can make up their own multinational dinner if they wish. Also, the purchasing and booking process was really easy and quick so that even people who are not computer geeks can order their preferred dishes. With discounts and other regular offers, the website guarantees the best online price, while payment methods are vast and secure. It is extremely useful for busy persons who want quality food and want to get rid of the hassle of cooking. G’day and welcome back Xin! Always remember the ol’ adage quality, not quantity…feel free to pace yourself and look forward to what you and Tina cook when you both get settled back to reality after your long trip! Thanks Joanne! It’s just that I got so many posts resting in my folder and need to do some cleaning. 😛 lol Hope you had a great Christmas! Welcome back, James! Now that you are back, I am taking some times off… 😀 ))) in April and May a trip to India, Malaysia, Oman, Dubai and all East Africa to Cape Town. Are we going to hear about your last few month’s endeavor? Welcome back! I have been on your blog quite often during the time you are away and truly missed your style of food. I use Eat Now from time to time and they never disappointed me. Thanks for the good words Jessica! I’ll need to put more efforts into the blog now.